In a small saucepan, combine water and sugar. Bring to a boil, and boil for 3 minutes or until sugar dissolves. Add 1/2 tsp. anise seed. Let steep and cool completely. Strain through a fine sieve to remove anise seed. In a blender, process watermelon in batches until smooth. In a large bowl, combine watermelon, cooled and strained simple syrup, and the lemon juice. Pour into a 13x9-inch baking pan, and place in freezer. Freeze for 3 - 6 hours or until no liquid remains, scraping with a fork every 2 hours. To serve, allow Granita to stand for about 10 minutes. Rake and serve in cups. Amazingly, the flavor combination met my expectation on the first undertaking. Intending the anise to be a compliment to the Granita rather than an overpowering flavor, it was steeped in the syrup for just 15 minutes. This method allowed that anise to give a subtle, slow developing flavor. The lemon juice offset the sweetness perfectly. 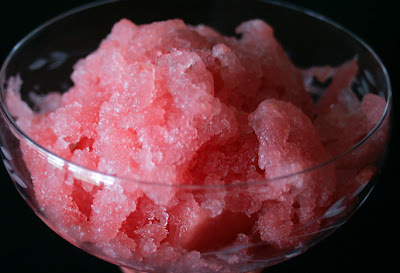 The Granita can be served alone, similar to Italian Ice, or piled high upon chucks of fresh watermelon, as shown in the photos. 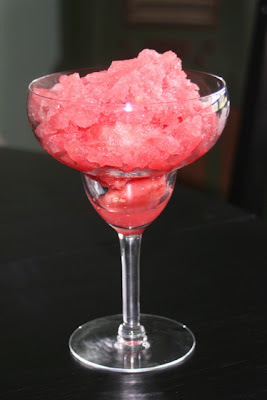 And, after photographing I whipped up a watermelon slushy. Aromatic? Hubby commented at several different plating times, “The whole house smells of watermelon.” To that, I declare success and YUM!